I never understood why, but commonly there is a tendency to believe that any one thing “made to the computer” is simpler than the same thing done by traditional methods. Beyond the Fence, for example, it is a very complex project, of high technical level; an innovative project coordinator and producer Catherine Gale called a mad experiment. Please note in which the idea of being able to realize a complex artistic project – music, in particular – through the application of automated procedures, that is, by adopting the algorithms to be executed by one or more computers, is anything but new, and knows well who are familiar with this blog. Of crazy experiments, in the second half of the twentieth century, they have seen a lot; and there have been many experiments in the field of computer music, and between all we could cite at least the Illiac Suite Lejaren Hiller. The novelty in Beyond the Fence, compared to the latter work just mentioned, is to attempt to apply of automatic composition not only music but also to all the other constituent elements and features of a show as a musical: then the text , the subject, the script, the set design, and everything else. On second thought, a reference model closer to the project Beyond the Fence is offered by a big media event created in 1969 by John Cage and Lejaren Hiller: HPSCHD. But back to today. The first step for the realization of Beyond was done with the analysis of other successful musicals. The survey, conducted by the Machine Learning Group at the University of Cambridge, was intended to find out what they were, and if there be any, any peculiarities in common between the different works. In other words, researchers have wondered if it was possible to identify common features in the works of the most successful and if these features were present or not in musicals less noble. The analysis was conducted on the number of actors, the scenery, the emotional content (if there is love, hatred, etc.) And other elements, in order to understand what were needed to ensure the success of Beyond the Fence. Defined the subject and key characters, even the plot was written by applying algorithmic procedures, through the use of software PropperWryter Complutense University of Madrid and the supervision of Pablo Gervás. In the middle Pablo Gervás Universidad Complutense de Madrid with Benjamin Till and Nathan Taylor (left). And the music? Needless to say, also it was composed by algorithmic procedures, performed through a software whose name is a tribute to the greatest composer of musicals: Android Lloyd Webber. Developed by Nick Collins of the University of Durham, the program is also based on an analysis prior to other similar works. Nick Collins presents the music software Android Lloyd Webber to Benjamin Till, English composer. But it’s all grist computer? Not exactly. 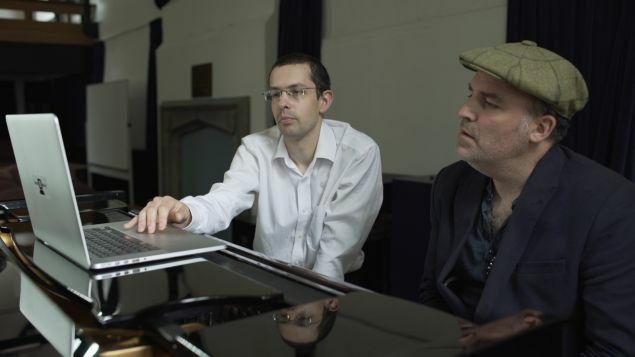 At the computer it was joined a duo totally human, the composer Benjamin Till and her husband the writer and actor Nathan Taylor, in charge of reorganizing the material obtained with the software to create the score and the entire script. The goal of the project, therefore, is rather to understand the extent to which creativity can be explored (or realized) through technology, help to resolve some major issues affecting the relationship between art and science, to try to answer a question as “science can make art?”. For the time before a response can come from the Arts Theatre in London, where from February 22 to March 5, 2016 will be staged Beyond the Fence, a love story set in the early eighties of the twentieth century, a show that beyond any consideration will be remembered as the first musical produced on the computer.